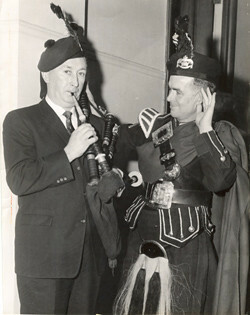 Frank McGovern, Grand Marshall of St. Patrick's Parade, gets lesson from John Duggan of St. Lawrence O'Toole Pipe Band of Dublin, 1960. 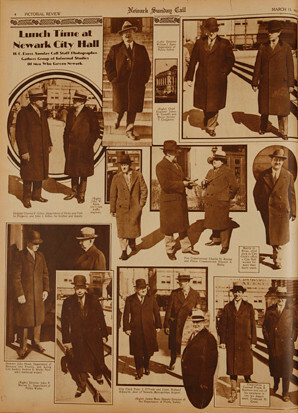 The Irish "Men who Govern Newark," Newark Sunday Call, March 15, 1931. 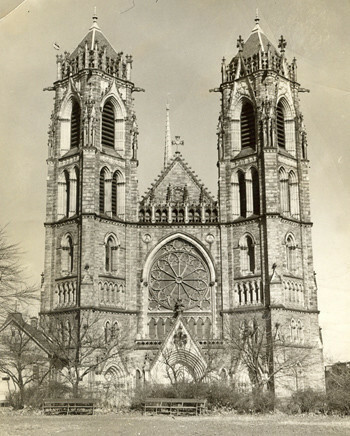 Two of the city’s most successful Irishman designed and built Newark’s landmark Sacred Heart Cathedral, one the finest examples of French Gothic architecture in the United States. Jeremiah O’Rourke designed and Edward M. Waldron built it, Irish laborers providing the muscle along the way. It took 56 years, 1898 to 1954, to complete. Patrick McCann's tavern on 163 Summit Street, Newark, St. Patrick's Day, 1938.
reviews the colors of the troops returning home in 1918. 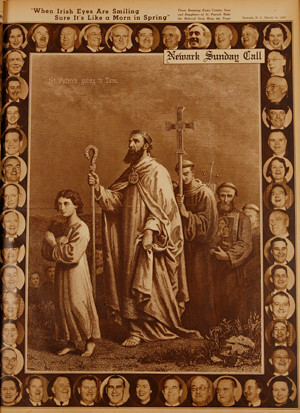 Pictured are "These Beaming Essex County Sons and Daughters of St. Patrick": Newark Sunday Call cover, March 14, 1937. 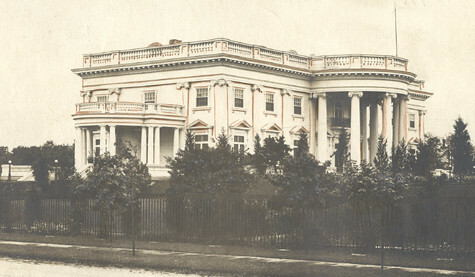 Ballingarry, Martin Maloney's residence in Spring Lake, was one of the great houses of the eastern seaboard. 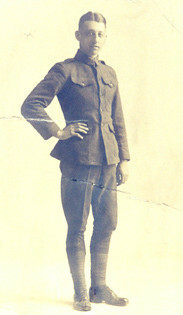 Deputy Chief Matthew P.A. 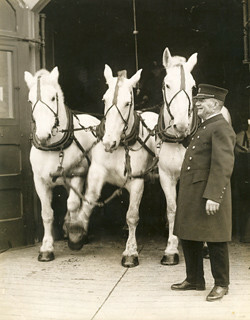 McDermitt is shown here with the horses used to do the last demonstration run of the old horse-pulled steam engines, Newark, December 20, 1923. The horses were replaced by a new modern motorized pumper, ending a picturesque era. 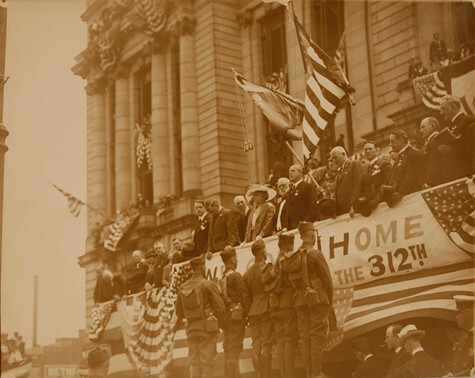 World War I came to an end on November 11, 1918, but remains of those killed were not all returned quickly. One of those who made the supreme sacrifice was Sergeant William T. Duffy of Newark, who was killed at St. Mihiel, France on October 3, 1918. His was the last American soldier’s body brought back from France for reburial. In 1918, Etta Fallon was appointed as one of the first three policewomen in Newark. During her first four years she reviewed motion pictures as a member of the vice squad. 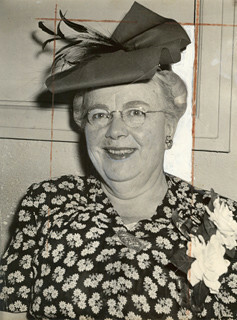 She later served in the city’s Family Court. In 1943, she was promoted to Sergeant and retired in 1948 with that rank.